The time is 1946. World War Two is over. Germany is split between democratic powers and communist powers. The capital of the former unified nation, Berlin is located in Soviet controlled East Germany and is also split between democratic and communist powers. Internal fear of communist influence is rampant among free, capitalist societies, especially in the United States. But externally, Americans are striving to move beyond the wartime culture. American soldiers have returned to their loved ones by the thousands. Families that were put on hold during the four long years of warfare are now anticipating a new day. Veterans reunite with their wives and sweethearts and young families begin to flourish. 3.4 million babies were born in 1946, 20 percent more than the previous year. The next year saw another 3.8 million babies born, and that number continued to rise to more than 4 million births every year between 1954 and 1964 (1). The "Baby Boom" had begun and would continue the entire eighteen years, a generation of American youth with their own complexities. This massive increase in population bred its own problems. Much of the industry and construction in the United States had halted during the war years. New homes had not manifested in any level as experienced prior to the war. Thousands of young American families were standing there bearing suitcases and cribs in need of housing that didn't exist. What could be done to remedy this challenge? The answer comes in the form of this man, William Levitt. Levitt was part of a family construction business consisting of himself, his father and brother. Levitt & Sons began work in the real estate business in 1929 when it was founded by Bill's father, Abraham (3). They built homes in the New York area. Bill Levitt served as a Seabee during World War Two. The United States Navy Construction Battalion, or Seabees, were involved in building landing strips, roads, and military bases in the Pacific during the war. It was here that he learned the skills necessary to build things quickly and efficiently, and the management and purchase of materials economically. Levitt brought that experience home to his family business. Levitt saw the need for more housing in his area and the rest of the country. He also saw an opportunity for financial opportunity. Before he even returned to the United States, the company began buying farmland that would be converted into neighborhoods with basic economical housing. They fashioned a system that would build a house in twenty-six steps (4). Within time, the builders of Levitt homes could finish a home in sixteen minutes (5). 17,000 Levitt homes were built in the first four years of construction (6). The new homes needed for the returning GI's and their Baby Boomer families had arrived. 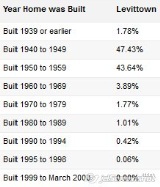 Levitt & Sons saw their explosion of construction of homes between 1940 and 1960, with the most significant construction period being between 1947 and 1954.